Website: alicegiles.com – all of Alice’s extensive discography can be brought through her website. 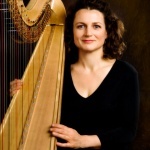 Alice Giles has been celebrated as one of the world’s leading harp soloists. The Australian-born musician first attracted international notice when she won First Prize in the 8th Israel International Harp Contest at the age of 21. A Churchill International Fellowship recipient, Alice made her New York debut recital at Merkin Hall in 1983. Since then she has performed extensively both in recital and with orchestras in Europe, America, Australia, and Israel, performing in venues such as London’s Wigmore Hall, New York’s 92nd Street Y and Merkin Hall, and as a guest artist at numerous festivals, including the Bath Mozartfest, Insel Hombroich and ‘Ja, Musik!’ Festivals in Germany, World Harp Congresses in Copenhagen and Vancouver, the Edinburgh Harp Festival, Adelaide and Sydney Festivals, and the Musica Viva Festival. Alice is the Artistic Director of the Seven Harp Ensemble, which regularly commissions and performs new works by Australian composers. In 2011, Alice travelled to the Antarctica as the recipient of an Antarctic Arts Division Fellowship, culminating in the multimedia performance Alice in Antarctica that she is currently performing both in Australia and internationally.